Café Tournesol (Sunflower Café) is a friendly, casual, somewhat artsy café in the Montparnasse area. 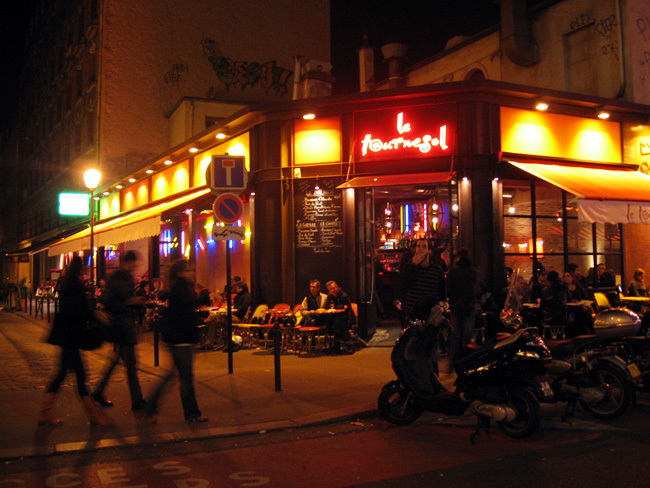 The ambiance is interesting and not at all typically Parisian; the exposed bricks, warm colors, subdued lighting, and airy openness of the place all make it feel a little bit more like an American café, but you're still surrounded by beautiful Parisians everywhere! Fascinating! Perhaps noteworthy, this is one of the few cafés in Paris that I think is even more worthwhile in the winter than in the summer; I love the interior atmosphere but their outside terrace winds around onto a small street that's really not interesting and not great for people watching (unless you get a great table right at the corner). So, in nice weather when you want to be outside, there are better places to hang out, but if you're going to be inside anyway, Le Tournesol is a great choice!